Mooli Paratha is a soft & healthy Paratha Recipe, made with whole wheat flour,Radish & some Spices. 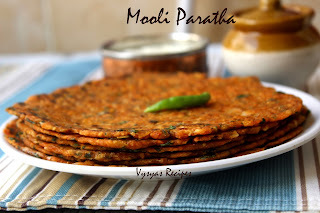 Mooli Paratha is a Popular Punjabi Recipe. Health benefits of radish incude,it is packed with the antioxidants and isthiocyanates which can kill cancer kills.It high water content helps in maintaining the body moisture level and preventing from the dehydration.Radishes are the natural food having cooling effect on the body which decreases down the excess body heat during summer season.it prevents the kidneys and urinary system from infection and other disorders by removing excess toxins from the body.Now we will learn to make healthy Radish(Mullangi) Paratha. Radish - 3/4 cup ( Medium size Radish 2). Peel & grate the Radish, mix with little salt & keep it aside for 15 minutes.Then squeeze the Grated Radish, & reserve the squeezed water for mixing the dough. Take a Mixing bowl add Grated & squeezed Radish, Wheat flour,Chilli Powder,Cumin Powder,Garam Masala,salt, oil & corinader powder. Mix well. Then sprinkle reserved Radish water to make the dough. Be careful while adding water. Roll into parathas.Sprinkle some flour while rolling paratha. Heat the tawa, when tawa is hot, place the paratha & cook on both sides till Golden spots appear. Use Ghee or oil, while frying parathas. Always use squeezed Radish, while making the dough. you can add 1/4 tsp of turmeric powder, while making the dough for nice colour. Adding coriander leaves enhances the flavour of Paratha. As soon as you make the dough,make parathas else radish oozes the water, & the dough will be sticky while rolling. 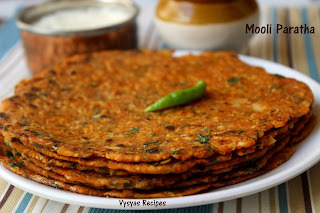 Serve with Curd, butter or Pickle.